1. Pulse the butter in a food processor until soft. Sift in the icing sugar and pulse until mixed. Add the egg yolks and vanilla, and pulse until there's no streaky yolk. Sift in the flour and pulse again until you can see no flour and the pastry comes together in large flakes. Divide the mix into two, shape into flattish circles in clingfilm and chill for 30 minutes. 2. Once the pastry is chilled and workable, roll out on a floured surface to the thickness of a coin. Cut out circles with the round cutter and push into the muffin tin. 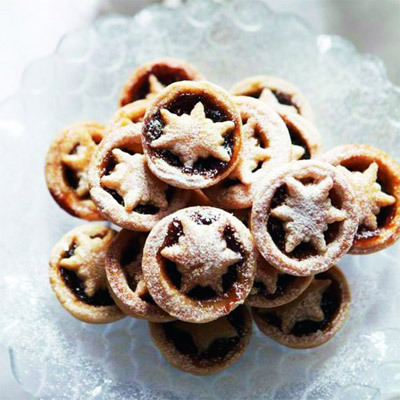 Fill with 1tsp mincemeat, then use the star cutter to make the tops. Chill well. 3. Heat the oven to 200°C / 180°C fan / gas 6. Glaze the mince pies with beaten egg and bake for 15 minutes until the pastry is golden and the mincemeat is bubbling over the sides. Allow to cool slightly in the tin, then cool completely on a wire rack. Dust with icing sugar and serve.